Here are the steps to install SEBLOD CCK onto your web server. After reading this documentation, you should be able to install the CCK. 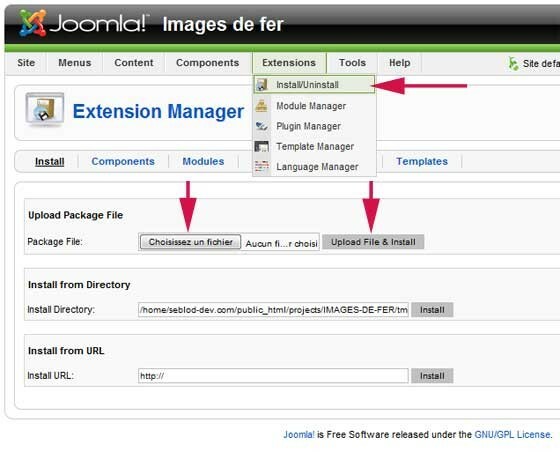 To install and configure Joomla, we invite you to read help on www.joomla.org. Install Steps : You must be loggin in Joomla administration as Super Administrator. SEBLOD CCK installation is full automatic. One time installed, SEBLOD CCK can be use directly. If you have any problem for the installation look on the end of this article. Store the file on your computer hard disk. The zip file of SEBLOD CCK weighs more than 1.5 Mo. SEBLOD CCK installer come from the next Joomla release, Joomla 1.6. It's optimize to encounter no problem despite the size of the zip file. 2. 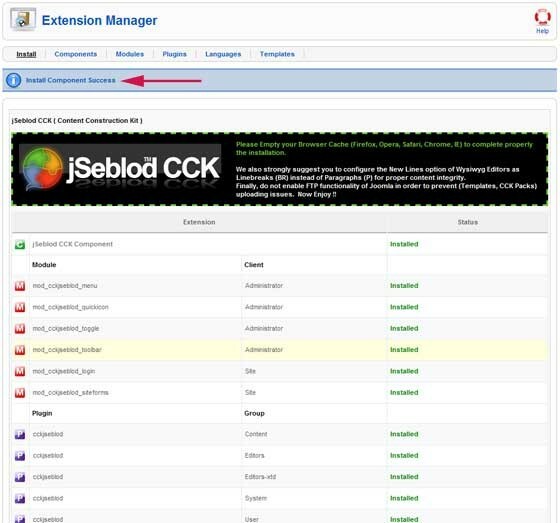 Install jSeblod CCK in Joomla! The "Install Component Success" confirm the success of the installation. 1 component, 6 modules et 5 plugins installed and a set of content type template. Plugins and modules are automatically published (except jSeblod Extended Admin Menu, cf option). Don't active FTP function from Joomla to not encounter some problem when you import or export templates and CCK pack. Verify that "Content - Cckjseblod" plugin is the first in the list of "Content" type plugin : Menu Extensions > Manage Plugins, Select at the top right with the dropdown list "content" plugin, verify that "Content - Cckjseblod" plugin is in first position or change it to be. You can display in Joomla administration main menu a set of shortcut for SEBLOD CCK. Very useful to win some time. Unzip SEBLOD CCK zip file uzing your favorite software into a new folder on your desktop. Rename that new folder to jseblod_cck (or any name that you prefer). Upload the jseblod_cck folder to your Joomla /tmp directory using your FTP software. You don't have to uninstall each module and plugin, all is uninstalled when the component is uninstalled. If you don't the Joomla toolbar (save, apply, close button...) after uninstallation of SEBLOD CCK, go on module manager, click on administration panel and publish again the module called "toolbar". Download the good UPDATE PACKAGE jSeblod CCK 1.5.0 release. Browse the jSeblod CCK package, and click on “Upload File & Install”. Edit all templates, select the template type (form, content or list) and save. If you use fieldX field, edit each field, put in separator and save it. Enjoy !